This is the Ultimate Kauai Adventure. Discover the inaccessible areas of Kauai from a birds-eye view on this amazing 60 minute Doors Off Private Kauai Helicopter Tour. 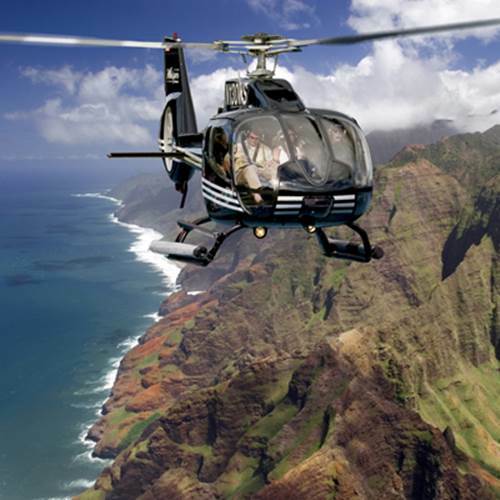 Optional Doors Off on this Private Kauai Helicopter tour. In this complete Island Tour, you will see Kauai in its entirety. Island highlights include: Waterfalls (including the famous “Jurassic Waterfall”), Waimea Canyon, Napali Coast, Mount Waialeale. Private Tour includes a guaranteed window seat, passengers may choose individually whether they would like their door on or off, and two-way communication for all passengers with the pilot during the entire standard tour route. 3501 Suite 1008 Rice Street, Lihue 96766. We will shuttle you to and from the airport for your tour. The aircraft departs from the Lihue Airport. Restrictions: Total weight per seat not to exceed 275 lbs. Total passenger weight not to exceed 600 lbs. Children must be at least 7 years old and a minimum weight of 40lbs is recommended.2-way communication between pilot and passengers is provided. The pilot personally narrates the tour. NO MIDDLE BACK SEAT. Everyone is GUARANTEED window seating. Mahalo! So glad it all worked out and look forward to seeing some of your photos. This was our first time to Kauai and first time to experience riding in a helicopter. Adrian was our pilot and he was fantastic!! He was very knowledgeable of the island and had plenty of interesting things to share. You could tell he genuinely wanted us to have a wonderful time and did all he could to make it a great flight. The doors off was such a thrill and I would definitely suggest doing it this way! (Just make sure to bring a jacket.) We enjoyed the private tour being just us two and the pilot. Tanya helped us out a great deal as we tried to figure out what would be best for us. There was a miscommunication on the time of our tour and she did all she could to make it perfect for us, and honestly we couldn’t be happier with how it all turned out. Thank you Tanya!! I highly recommend doing this helicopter tour! You will not be disappointed! Make sure to book all your activities with Tanya at Kauai.com. She knows all this stuff and is very honest, and kind. There was a storm coming in and we were a little nervous but Tanya kept us calm. It ended up being a perfect day. As for the helicopter ride, all I can say is “WOW.” There is nothing like seeing this Island from the air. Our pilot (Forrest) knew everything about the island and its history. Well worth every penny. BTW…Watching the whales from the air is awesome. This was my first flight in a helicopter and it was so awesome. When you arrive at the airport you see all the other helicopter’s and it seems to me like the kind this company uses is the best. This is because they are small, you always have a window seat. You can have them take the doors off, and because it is so small there is less helicopter to get in the way of everything there is to see. Things get really beautiful about 10 minutes in once you get away from the populated areas. While I haven’t tried the other companies, I can only say that this was amazing. Our pilot was really cool and made it even more fun. It was also a great way to discover all the different things to do on the island. I would recommend doing this as one of the first things you do after arriving on the island.